Those who have never had the pleasure of floating through the air, paragliding in Cape Town, often have numerous misconceptions about this exhilarating activity. Fly Cape Town Paragliding has covered many surprising facts surrounding paragliding. Whether you are thinking about going paragliding for the first time, or if you simply want to learn more about this form of flight, you will likely find many of the following facts intriguing. As you paraglide, you are connected to the wing by at least 30 different lines, which are all strong enough to support your weight. When it comes to airborne sports, such as paragliding or hang-gliding, paragliding is considered to be by far one of the safest. Accidents and injuries are extremely rare, as long as the paragliding takes places in suitable weather. The flight is also safer if conducted at higher altitudes, high enough to allow a backup parachute to deploy in plenty of time. Many people who want to go paragliding in Cape Town make the mistake of asking for hang-gliding or parasailing, which are certainly not the same. Hang-gliders have rigid wing structures, while paragliders have soft structures that can be collapsed and transported easily. When you paraglide, you also fly at a slower rate than if you hang-glide, making paragliding easier for beginners. If youve ever seen people being pulled along behind the back of a boat, under what looks like a big parachute, this is parasailing. These structures are not guided by those who are actually flying, but by those who are pulling them along at the surface. 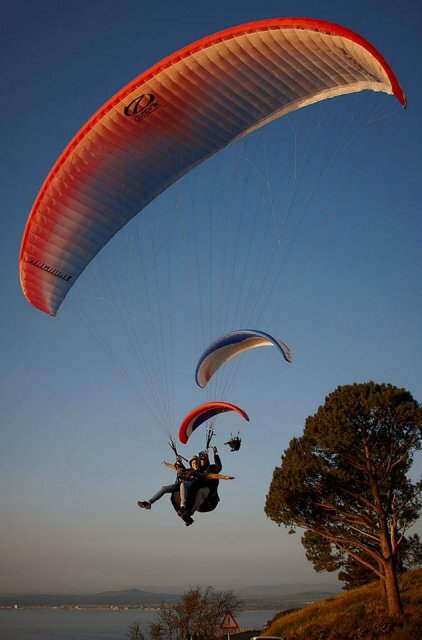 Many people assume that they will not truly be able to enjoy paragliding over Cape Town because they will be distracted by an uncomfortable safety harness and restrictive seat. In reality, modern paragliding harnesses are as cozy as sitting in a lounge chair  some even have built-in lumbar support. Steering a paraglider may not be as simple and easy as driving a car, but the pilot does still have a surprising amount of control. At the pilots fingertips are apparatuses that control the sides and trailing edge of the glider. Using these controls, the pilot can subtlety control the speed and direction of the structure. The only element left to chance is how high the paraglide journey will go. This depends largely on the pilots ability to find columns of rising air or thermals, as well as a bit of luck. Pilots who are able to find pockets of thermal air can keep paragliding for extremely long distances. When paragliding in Cape Town, you might enjoy trips that last approximately 10 to 30 minutes at the most, but experienced pilots have been able to paraglide for hundreds of kilometres, enjoying some of the greatest views in the world.